For the first time, motorsport fans in Singapore can look forward to a thrilling combination of howling engines, screaming tyres, and an electrifying line-up of party beats and entertainment acts as the fourth edition of the VIP Formula Drift Singapore Presented by Achilles Radial returns on 11 and 12 June 2011 at the iconic F1 Pit Building. 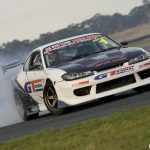 In addition to showcasing the region’s top drivers, this year’s event aims to elevate the spectators’ experience with an exciting mix of the best drifting action and entertainment. Organised by ESPN STAR Sports Events Management (ESS) with the support of Title Sponsor VIP Luxury, Formula Drift fans can expect more than just a motoring spectacle with an exciting line-up of musical artistes, promising to keep everyone’s engines revving late into the night. 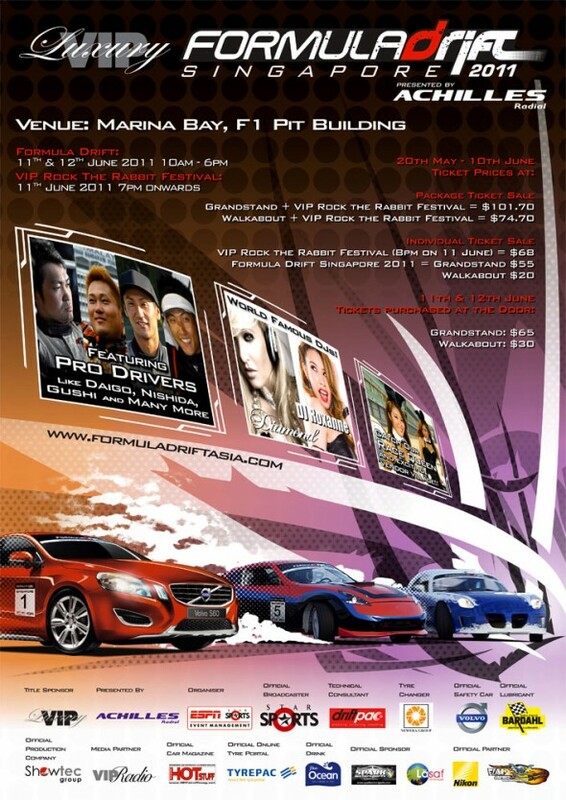 This is the first time that VIP Luxury is involved with a sporting event, and is looking to make an impact with the drifting event, which has already established a strong following in Singapore. VIP Luxury will be going all out to make sure that guests are entertained throughout the evening, with VIP Rock the Rabbit Festival, pulling out all the stops to keep fans entertained for the entire night. VIP Formula Drift Singapore 2011 Presented by Achilles Radial has established itself on the region’s sporting calendar, attracting top drifting talents and interest from all across Asia. This year’s event continues its strong global flair with more than 45 drivers coming from Singapore, Malaysia, Philippines, Indonesia, China, Japan, Thailand, Hong Kong, and New Zealand. With top international drivers such as Japan’s Robbie Nishida, Australia’s Joshua Boettcher and last year’s Formula Drift Asian Champion Tengku Djan Ley, the ‘Prince of Drift’, from Malaysia, this year should be one of the most competitive in the event’s history. The Singapore event is the first of a four-leg series for Achilles Asian Drift Series which will be followed by events in Indonesia in October, Thailand in November and the year-end Grand Finale this December in Malaysia.